Priscilla Morgan, daughter of Thomas and Ann Watkins Morgan. The above picture of John Franklin and Priscilla Morgan Radford was probably taken in early 1873. They would have been living in Leamington, Utah at the time and Priscilla was already pregnant with her second child. The child in this picture is probably John William Radford, born 22 March 1872. Click on the link above to see a picture we are trying to identify. 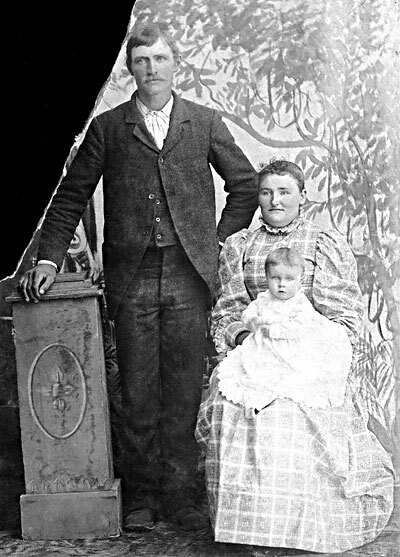 The picture above is the John Franklin and Priscilla Morgan Radford family taken about 1885 or 1886. Priscilla Morgan was the fifth child of Thomas and Ann Watkins Morgan. She was born in England in August, 1854 and was a small child when she was brought to America by her parents Thomas and Ann Morgan in February 1855. 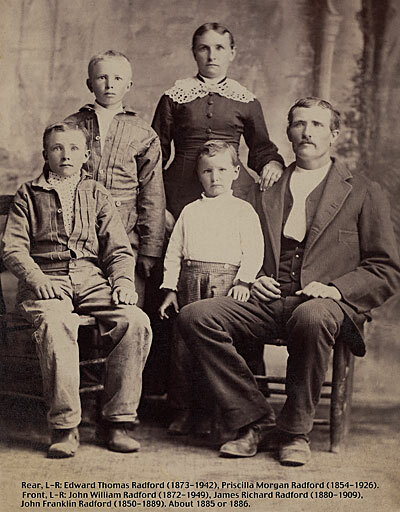 After they arrived in Utah the Thomas Morgan family and John Whitlock Radford family were closely associated. Priscilla and Everal Hannah Morgan (Sisters) married John Franklin and Daniel Radford (brothers). Neither of these Radford brothers lived long lives. John Franklin, Priscilla's husband, died in 1889 just before he turned 39. Daniel Radford, Everal's husband, died in 1906 at the age of 49. Priscilla Morgan married John Franklin Radford on July 24th, 1871 in Oak City, Utah. Priscilla's parents, Thomas and Ann Watkins Morgan, were living in Oak City Utah at the time. John and Priscilla had five children, two of whom died young while living in Leamington, Utah. In about 1887 they left to pioneer in a new community in Oregon. John Franklin died in Vale, Oregon in March 1889. In about 1891 Priscilla migrated to Rudy (now Clark), Idaho, where she remarried and raised her family in the home of her second husband, Isaac Chase. The marriage of Ike Chase and Priscilla produced no children. Priscilla and her family were not involved in the move her related Morgan, Radford, Ryset and Hadden families made to Wyoming. John William Radford, born 1872 in Oak City, Millard, Utah. Married Julia Elizabeth Ross (Daughter of Melvin and Mary Ellen Haddon Ross who was named after Melvin Ross's first wife Julia Elizabeth Smith Ross) 11 Dec 1900. Died 21 January 1949 at Ririe, Idaho and is buried in the Shelton, Idaho cemetery. Edward Thomas Radford, born 6 Oct 1873 in Leamington, Utah (By 1873 Priscilla's parents Thomas and Ann Morgan had moved to Leamington and apparently Priscilla and John moved there also). Married Wealtha Permila Wilbur 24 November 1898 in Rudy (Clark) Jefferson, Idaho. Died 20 December, 1942 at Twin Falls, Idaho. Sarah Ann Radford, born 12 March 1876 in Leamington, Utah and died 21 March 1878. Franklin Radford, born 4 February 1878 at Leamington, Utah and died 11 November 1881. James Richard Radford, born 29 March 1880 at Leamington, Utah. He married Annie M. Mower 26 Sept 1905 at Pocatello, Idaho. He died 6 May 1909 at Perry, Idaho and is buried in the Shelton, Idaho cemetery. Priscilla Morgan Radford remarried after her first husband died. She married Isaac (Ike) Chase and they lived in the Ririe Shelton area. Her father, Thomas Morgan, spent his last days at Ike Chase and Priscilla's house. Priscilla and Ike Chase both had children from previous marriages, which they raised together after they married, but their marraige did not produce any children. Ike chase died not too long after Thomas Morgan died in 1915. Priscilla died in Ririe 4 March 1926 at the age of 72. 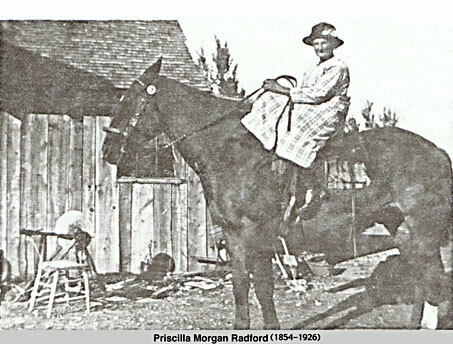 How about this wonderful old picture of Priscilla Morgan Radford Chase on a horse (She was no spring chicken when this picture was taken, but could still sit a horse). In the background is one of the old foot-powered grinding machines that my dad used to sharpen the hay mower blades.